When you search “jumping castle hire” on Google you are flooded with choices of companies. What you may not notice at first glance is that there are two different types of operators available to you. Which one you choose will very much depend upon the type of event you are hosting. The first type are Amusement Ride Operators. These operators usually have a range of both mechanical and inflatable rides on offer. They are more geared towards supporting public events. There is a broad mix of operators within this group too, so be sure to check out our post on How to Spot a Dodgy Operator. The second type are Party Hire Operators. They usually only offer a range of inflatable rides and are looking after your private parties. When weighing up which one is best for your event here are a few quick things to consider. Amusement Ride Hire Operators should provide a trained operator to supervise each and every ride. This is required to be documented in their log books which are available for inspection by SafeWork NSW. (Check out previous post above for more information on this). Party Hire Operators usually do a “dry hire” arrangement, where they will drop a ride to your party location and leave it up to you to provide supervision. Amusement Ride Hire Operators will provide their own Public Liability Insurance for anyone injured on their rides. Party Hire Operators will generally require you to sign a waiver, whereby you should be responsible for anyone injured on their rides through misuse of the ride while it is under your supervision. You should ensure your Home Insurance covers you for this if someone was to injure themselves at your home party. That said, every event should hold their own Public Liability Insurance these days. Amusement Ride Operators have to pass annual safety inspections on their mechanical rides, and in dealing with larger scale events, are used to performing safety assessments and procedures. They should be performing similar in house checks with their own inflatable rides, and every inflatable should pass Australian Standards. (Again see previous post for more details). 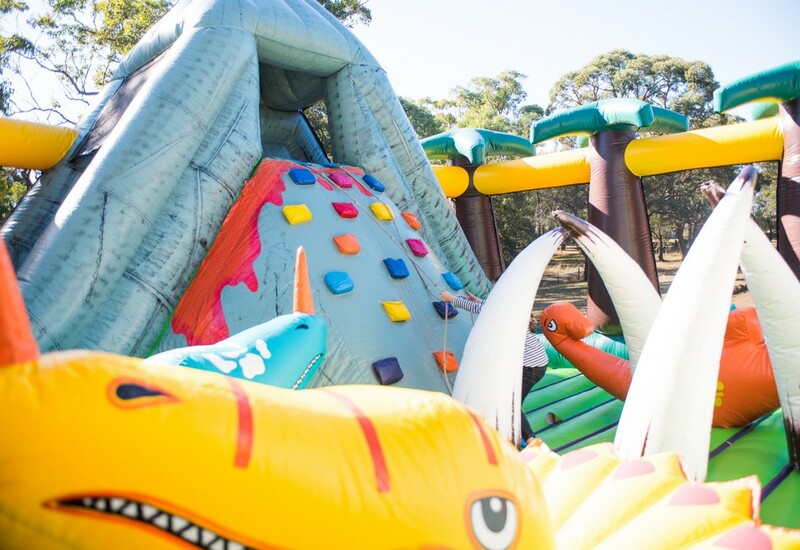 Party Hire Operators can buy an inflatable ride from China (not all pass Australian Standards) and drop it off to your house without you being sure if it is safe or not. At the very least they should set up the ride for you, with all tie down points secured to the ground (not with sandbags!!). You should visually check that all ropes are free from excessive wear and that any electrical equipment and leads are all tagged. Due to the outlay of wages and insurance, as well as the scale of some of their rides, Amusement Ride Operators will be a more expensive option for you to hire. We hope this helps with your decision on the type of operator you need for your next event. If you have any questions please call 1300 CAMELOT for help.